To celebrate the start of the spring, the companySmile-Expo offers a50% discount for tickets to Prague iGaming Affiliate Conference– event about the affiliate marketing in online casinos industry. On March 4-8, the price of the tickets to Prague iGaming Affiliate Conference will be reduced by half. Ticket on March 4-8: 3500 CZK. Ticket on the day of the event: 7000 CZK. The event about gambling and affiliate programs, Prague iGaming Affiliate Conference, will take place in the Czech Republic on April 18 and will include the conference and the demo zone. The event will gather experts in traffic arbitrage, online casino operators, SEO specialists and experienced marketers. At the event, leading industry specialists will focus on the topic of affiliate marketing and will also discuss gambling and online casinos. Panel discussion will become the part of the event.Experts will talk about the regulation of online casinos’ work in the Czech Republic and other European countries. Jan Řehola — a lawyer who worked for 4 years for the Ministry of Finance of the Czech Republic as a Director of Gambling Department. He will take part in the discussion and feature the pros of blockchain and cryptocurrencies in the iGaming sphere. Raffaela Zillner — Secretary General of the Austrian Association for Betting and Gambling. Along with other well-known lawyers, she will dwell on the current legislative framework of the gambling sphere in the Czech Republic. Steve Donoughue — a management consultant specializing in the gambling industry for 20 years. Focused on business strategies. In his presentation, Steve will tell why affiliates need a trade association. Christina Thakor-Rankin — a consultant with 25-year experience in the betting and gaming industry. She will tell how to attract and retain Generation Z clients. Nicc Lewis — an experienced marketer, CEO at Expozive agency. The speaker will unveil the prospects affiliate marketing exposes to the modern iGaming sphere. The moderator of the conference is Vojtech Chloupek–President at Bird & Bird. Demo zone is a special place gathering companies from the iGaming sphere – marketing agencies, casino operators, software developers, affiliate networks, and legal firms. Prague iGaming Affiliate Conference will take place at Grandium Prague hotel near picturesque Vrchlického sady, Address: Politických vězňů 913/12, 110 00 Nové Město. The conference is organized by Smile-Expo companythathas been carrying out events on innovative technologies in business for 13 years. Details and tickets are available on the website of Prague iGaming Affiliate Conference. The event will be conducted by the international company Smile-Expo, which has been organizing big B2B events for 13 years. 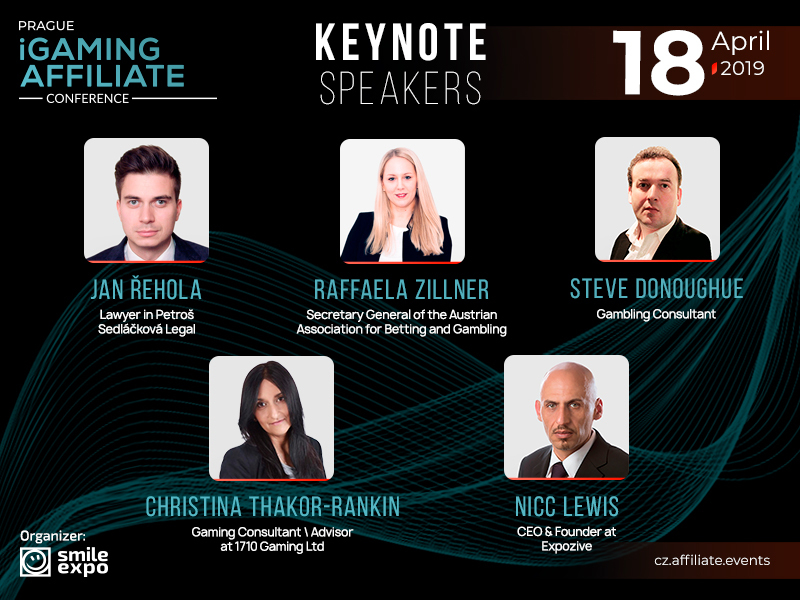 Details and the complete program of the event are on the website of Prague iGaming Affiliate Conference.